Kamloops is a great place to live, rest and play. Situated in the center of British Columbia it has all you could need for you and your family. There are a myriad of communities just a short drive from Kamloops all offering different views and styles. We have picked a few to highlight. Chase is another budding town in Kamloops country. Located 56 km (35 mi) from Kelowna on Hwy 1, Chase is known as the "Home to the Big Horn Sheep". This town combines spectacular scenery and nature that characterizes interior BC with all the amenities of a large city. Residents of Chase enjoy a splendid waterfront view afforded by the town's location on the outlet of the South Thompson River. This quaint and quiet town offers visitors a relaxing stop over at while traveling though British Columbia. Sun Peaks Resort is an international year-round resort just a short drive from Kamloops. Boasting 117 ski runs on three mountains, an average snowfall of 559 cm (that's 17feet!) and a visually stunning European-inspired village, Sun Peaks is one of the finest resorts in all of Canada. Even in the summer, this resort provides lots of recreation opportunities including a challenging 18-hole golf course and some of the most technical downhill mountain biking available. Located on the banks of the Thompson River on Hwy #97C, this former frontier town played key role in the development of central B.C. Once a center for government, Aschroft was also and an important link to the Canadian Pacific Railway. Passengers and freight bound for the Gold Rush communities would disembark and continue their journey on the nearby Cariboo Wagon Road. Later, cattle from the grasslands of the interior would be driven to Ashcroft and shipped south by rail. Located on Highway 5, 63 km (38 miles) north of Kamloops in the North Thompson Valley, Barriere is home to the North Thompson Fall Fair and Rodeo. Visitors with enjoy the many nearby lakes and rivers which provide excellent fishing and camping. Barriere offer a variety of services and accommodations. Blue River lies in the North Thompson River Valley, nestled in the Columbia Mountains. 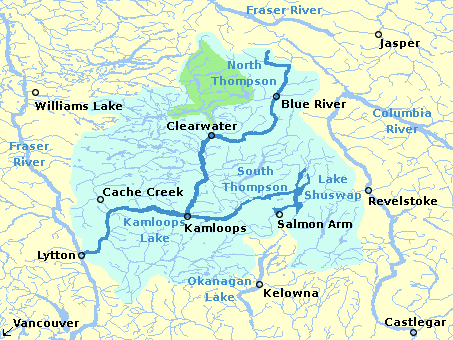 The North Thompson River flows south between the Cariboo mountains to the northwest and the Monashee mountains to the east. At an elevation of 681 meters, the community of Blue River is situated midway between Edmonton, Alberta and Vancouver, British Columbia. Access to Blue River is via BC Highway #5 - 230 kilometres north from Kamloops and 212 kilometres south from Jasper. The building of the Cariboo Wagon Road and the CPR railway, formed the foundation of the village that is situated on the steep banks of the Fraser River. During the gold rush, Boston Bar was a popular roadhouse stop. Across the Fraser River from Boston Bar, the CPR built their divisional point at North Bend. In earlier times, an aerial ferry was the only way across the river. Today there's a bridge. Boston Bar, along the Trans Canada Highway # 1 is in the heart of the Fraser Canyon. It is located 42 km (26 mi.) north of Yale and 34 km ( 21 mi.) south of Lytton. River rafting, fishing, gold panning, rock hounding and hiking are very popular past times in this region of British Columbia. Located on the old Cariboo Wagon Road, this popular spot was a stopping place for miners gathering supplies before heading farther north to the gold fields. Located at the junction of Hwy #1 and Hwy #97, and offering many facilities and points of interest, Cache Creek is now a popular stopping place for the modern traveller. The gateway to the North Shuswap, Chase is located just 56 km (34 mi) east of Kamloops on the western end of Shuswap Lake. Outdoor enthusiasts will enjoy a variety of activities. The community itself, with its warm summer days, has a golf course, beautiful beaches and parks, while the nearby lakes, rivers and mountains can provide everything from hiking, camping and mountain biking to water skiing or salmon watching. Clearwater is the gateway to Wells Gray Provincial Park, where visitors will enjoy the spectacular waterfalls, glacier-fed lakes, canyons and volcanic formations. For those interested in golfing or shopping, Clearwater township provides a variety of both. Ample accommodation is found here or you can camp in one of the many nearby sites. Located between Barriere and Clearwater at the intersection of the Yellowhead Highway #5 and B.C. 's famous fishing highway #24, the small community of Little Fort offers accommodation, restaurants and a pub, service stations, shopping, fly and tackle shops. Here you may cross the North Thompson River via one of two reactionary ferries. There are several guest ranches and fishing resorts nearby. From Ashcroft, Highway #97C heads up from the grassy rangelands to the forested hills around the community of Logan Lake. Along the way, visitors pass one of North America's largest copper mines, Highland Valley. Travellers visiting Logan Lake enjoy the sparkling waters of many beautiful lakes famous for the quality of their trout fishing, and fishing lodges. The blue green waters of the picturesque Thompson River, meet the muddy brown waters of the mighty Fraser at Lytton. This is river rafting country and there are first rate commercial rafting companies ready to take you on a ride of a lifetime. Other interesting activities include hiking, fishing, and rock hounding. Lytton, located along the Trans Canada Highway, is approximately three hours travel time from Vancouver, and only 40 km (25 mi.) from Spences Bridge. If you take Highway 12, it will take you to the historic town of Lillooet, which is only 65 km ( 40 mi.) north of Lytton. Situated in the ranchlands of the Nicola Valley, Merritt is at the junction of four major highways serving the High Country area. The entire area is rich in displays of its ranching heritage but also provides a number of opportunities to outdoor enthusiasts; the Merritt area is famous for its fishing lakes and fighting Kamloops trout. First rate guest ranches and resorts can be found in the region. Salmon Arm is located on one of the most popular resort lakes in the province. On the Trans Canada Highway, west of Sicamous, it offers visitors a wide range of recreation possibilities plus providing almost every service and convenience you could want. This quickly growing community is becoming popular for its climate and amenities. Truly one of B.C. 's outstanding summer playgrounds. Located just 45 km (28 mi.) west of Kamloops on Highway 1, Savona is a small community located on the western shores of Kamloops Lake. Savona and the surrounding countryside lends itself to a number of recreational activities such as swimming, boating, fishing, biking and rockhounding. It is also a jumping-off point for explorations of the nearby Deadman Creek Valley, located just west of the community. The area of Scotch Creek, and the North Shuswap (Lee Creek, Scotch Creek, Celista, Magna Bay, Anglemont, St Ives and Seymour Arm), is located on the north shore of Shuswap Lake - BC's undiscovered recreation paradise. The Houseboat Capital of Canada, Sicamous is located on the shores of Mara Lake and Shuswap Lake. Both these lakes offer a wide variety of activities for the summer visitor, from swimming and water skiing to houseboating and exploring. Shuswap Lake has over 1,000 km of shoreline and the area surrounding both lakes has an abundance of mountains, lush valleys and rivers to explore. Sorrento is known as the "Heart of the Shuswap" and is renowned for its beauty and recreational oppurtunities. Services including shops, golf courses, motels and campgrounds, marinas and numerous events such as the Shuswap Lake Festival of the Arts, Eagle Bay Days and Adams River Salmon Run make this community a relaxing getaway. Spences Bridge is located on Highway #1, 40 km (25 mi.) north of Lytton, where the highway crosses the Thompson River. Spences Bridge is famous for its steelhead fishing and one of the oldest operating hotels in British Columbia, the Steelhead Inn. Travellers passing through in spring and fall are most likely to see herds of big horn sheep on or near the highway. You often have to slow down or stop completely to avoid hitting them. A favourite spot for the sheep is in the school yard - when the students are inside! Centrally located in the Thompson Okanagan region of British Columbia's interior, the 4 season resort community of Sun Peaks is only 45 minutes north of Kamloops by car. It's also the closest interior resort by road from Vancouver on the BC coast … and Seattle, Washington … thanks to the Coquihalla Highway which connects Hope to Kamloops. Discover for yourself why 93% of visitors highly recommend the community of Sun Peaks to friends and family. Valemount, located on Hwy #5 between the Rocky, Cariboo and Monashee Mountains, offers exceptional fishing, hiking and camping oppurtunities. Valemount offers a vareity of restaurants, accommodation, shops, services and a golf course. Just past Valemount visitors may either turn left towards Prince George and Tete Jaune country or right to the Rocky Mountains and Mount Robson Provincial Park. Located on the banks of the Fraser River was founded in 1848 as a Hudson's Bay Company Fort and played a very important role in the development of British Columbia. Yale was the inland terminus of the sternwheelers plying up the Fraser River. The building of the famous "wagon road" was started here. Just south of town, at Hill's Bar, is the site of the first gold discovered in British Columbia. The documents establishing the Confederation of Canada were signed at Yale. This community is very proud of its historic background and this can be seen when you visit the museum and take the Historic Walking Tour of the town. Yale is only 32 km (20 mi.) north of Hope, on Highway 1.